Bored With The Food In Your Fridge? Just Zhuzh It! What do you do when you have some basil leaves and fresh cottage cheese in your fridge and you are bored and want to do something with it? Just zhuzh. It was one of those lean days when I thought we could get buy on khichdi (a curried, rice-and-lentil soupy dish) but I just didn’t want to eat more dal. I didn’t have much produce in the fridge, except for some basil leaves and fresh paneer (cottage cheese) which I had delivered that morning when I ordered milk. I wanted to use up my fresh basil before it turned all black on me and died a wilty death. I wanted to use my paneer while it was still fresh and crumbly. I didn’t have tomatoes. I didn’t have pine nuts. I had one sorry looking onion. Hmmmm…. I’d been having a lament for ricotta for a while now, but have not gotten a chance to go out and get some. I’d also been thinking, in particular, about this ravioli stuffed with ricotta and spinach I’d eaten ages ago at Little Italy in Chennai. And I was thinking about pesto. So, I decided to use the basil and the cottage cheese, throw in olive oil and garlic and zhuzh it up. Zhuzhing (the “zh” should be pronounced the same way the “zh” in Zhiyi Zhang’s name is pronounced,) is a word I heard first on the Rachael Ray show. She used the word ‘zhuzh’ to describe the action that takes place in a blender. (Not that kind of action!! This is a family blog!!) The process of putting stuff in a blender and giving it a whirl is “zhuzhing.” Then I heard the word on Oprah, courtesy her style guru Carson Kressley. He said the word “zhuzhing” meant to fluff or primp things up a bit, and was Carson heard it first when he was working at by Ralph Lauren. 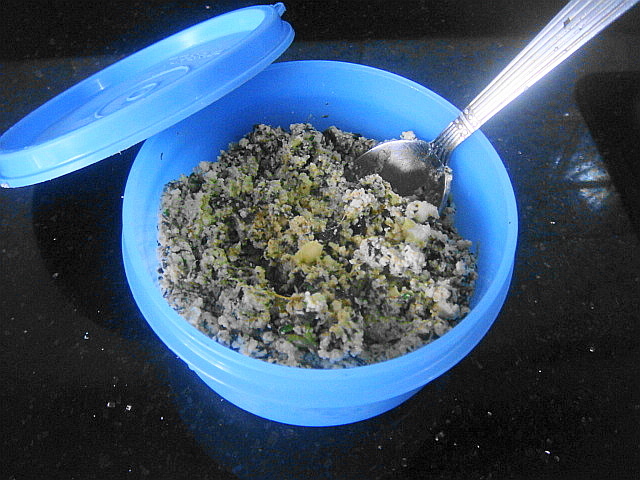 What I was planning to do with my basil and cottage cheese was a zhuzh in both sense of the words. I was sticking it in a blender with other ingredients and sprucing it up for the plate. 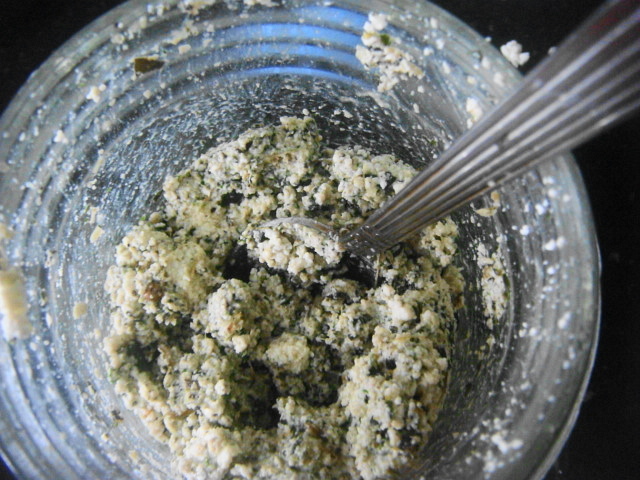 So all I did was take a about 5-6 basil leaves, 100 grams of cottage cheese, 2 cloves of garlic, 2 tablespoons of olive oil, 5 black peppercorns, some salt and zhuzh it in the blender. What I got was a nice, creamy, crumbly mixture which I could use as a sandwich filling, cracker spread or for pasta. If you zhuzh it longer, you’ll have something even creamier and could use it as a filling for ravioli if you don’t have ricotta. So that was my little exercise in zhuzhing. Is there anything in your kitchen or your wardrobe that you’d like to zhuzh up? Bon Apetit, folks. Have a yummy weekend! Oh god!! Not that nincompoop. He probably murdered the show in its infancy!! I cannot stand the dolt! Here is another show for you to check out- “CHOPPED”! Maybe you can start the Indian version and syndicate it. Happy zhuzhing!